This pane will only be displayed for Sound decoders. Several manufacturers now offer decoders that include sound functions. This pane is designed to control those CVs. 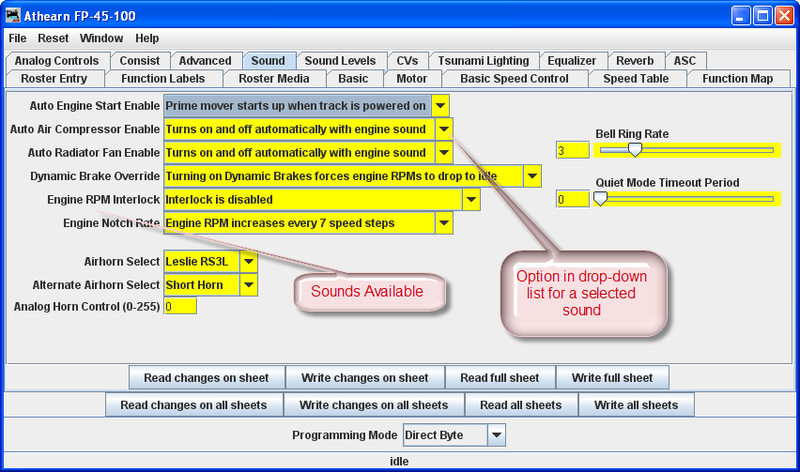 The screen shot below is from a programmer for Tsunami OEM FP-45 sound decoder. There are also steam sound decoders available. These sounds can be coordinated with the mechanism of the locomotive, and appropriate sounds can be triggered from the function keys of the throttle. Others can be set to be triggered at startup or to run in the background. This pane allows for the selection of sound effects from sound decoders, and the Sound Levels Pane allows for setting the loudness levels of those sounds when they play back. For specific function options, see your decoder documentation and the programmer for the specific decoder. Sometimes (depending on the volunteer that wrote the decoder definition file) there are "tool tips" that appear if you hover over a selection entry box.